So it has been a while since I've made a food post. However, I am still always trying new recipes, as well as stalking Pinterest and Food Gawker. 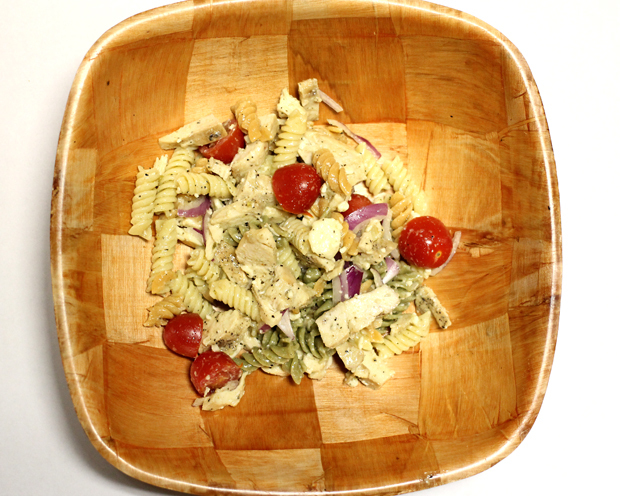 I stumbled upon this pasta salad recipe on Pinterest the other day and knew I wanted to give it a try. 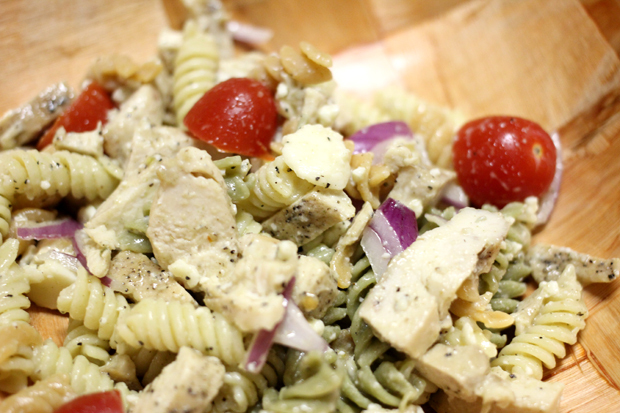 I've actually never been a pasta salad kind of person. That's usually the dish I skip over at barbecues. Somehow the ingredients and ease of this dish, spoke to me. Not to mention, with how hot it's been, this dish is a great fit. The verdict was....this dish was a hit!! I will definitely keep this in rotation! I suggest eating it along side a piece of pita bread, or something similar. Liberally rub chicken breasts with salt and pepper. Preheat a grill to medium heat and coat with nonstick cooking spray. Add chicken and cook until completely done, about 5 – 6 minutes on each side. Remove from grill and slice into thin pieces. While chicken cooks, bring water to a boil in a large pot. Add tortellini and cook for about 8 minutes, or until they are fully cooked (they’ll float to the top). Rinse. In a large salad bowl, mix the tortellini with the chicken. Add tomatoes, onion and sliced cheese. Whisk the dressing ingredients together in a shallow bowl. Pour over salad and stir in fresh basil. As you can see the only thing i did different, is the type of pasta. I couldn't find tri-colored tortellini, so I used rotini instead. I didn't grill my chicken--just baked it, then cut it into small pieces. Oh, and I also used a crumbled gorgonzola cheese along with the Baby Bell! Recipe courtesy of The Realistic Nutritionist. that looks so good! i love pasta salads. i'll be adding this recipe to my ever growing list!